Through Page Motors, this 540 K Cabriolet A was ordered new by a Mr Paine from Warwickshire. It was finished in light green with a pale yellow top, while the seats were upholstered in pig skin. Mr Paine took delivery of the car in December of 1936 but would only own the 540 K for a year. Its next owner was based in London and it believed the car remained in the United Kingdom through to the early 1960s. Following a spell in French ownership, it was finally repatriated to Germany in 1992. The car's first German owner would own through to 2009, when it found its second German home. 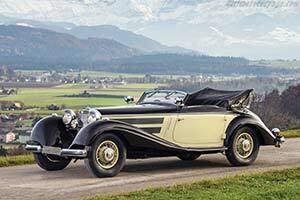 In the following years, it was restored and also further detailed at Mercedes-Benz Classic. Here it was also determined that the car has retained all of its original major components, although it was re-painted in different colours then when it was new. During the second half of the 2010s, the Cabriolet A joined a Swiss collection, from which it was then consigned to RM Sotheby's inaugural Techno Classica sale.